The CRC for Construction Innovation has developed a prototype software tool for estimating indoor air quality in commercial buildings. The Indoor Air Quality Estimator is an office design tool for selection of materials, office equipment, ventilation filtration to optimise indoor air quality and allow control of indoor air pollutants. Poor indoor air quality (IAQ) can be a significant health, environment and economic problem, and has become a public health issue and liability for employers and building managers who fail to provide a ‘safe’ working environment. There is a growing commercial and legal liability need for building owners and occupiers to better understand and to control the way in which they provide air to the occupants of commercial buildings. The supply air may be contaminated with fine particles and National Environmental Protection Measure “Air Toxics’ in buildings sited in city centres, or supply air delivered clean to the building can become contaminated with formaldehyde and VOCs from building materials, contents and appliances during and after construction or with renovations. All of these factors have different impacts on IAQ according to construction cycle time, building siting and design, building operation, and correspondingly are influenced by different players in the construction process. What is the IAQ Estimator? The IAQ Estimator is a prototype software tool for estimating indoor air quality in commercial buildings by combining existing indoor air quality measurement, product emission and ventilation/filtration knowledge into a practical model for estimating the indoor air quality of indoor spaces over time. The potential implementations of the model include both a stand-alone tool or as a commercial extension module attached to a 3D CAD evaluation package such as LCADesign. This approach will integrate three aspects of buildings affecting indoor quality: emissions from fixed large surface products, including furniture; operational activities such as equipment including computers and printers; and air intakes from outside a building. To integrate the above three factors for estimating indoor air pollutant levels within a building zone directly from the materials information available in a 3D CAD model or from information introduced manually. 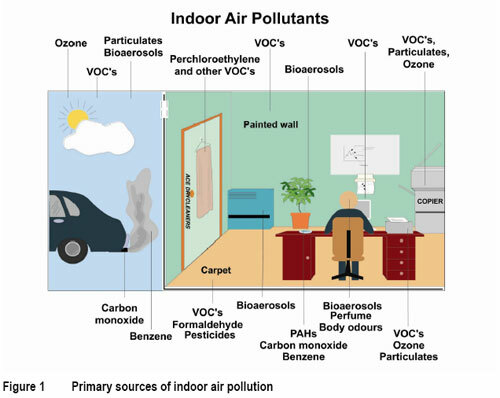 The indoor air quality in buildings is currently assessed by measurement of pollutants during building operation for comparison with air quality standards. Current practice at the design stage tries to minimise potential indoor air quality impacts of new building materials and contents by selecting low-emission materials. However low-emission materials are not always available, and even when used, the aggregated pollutant concentrations from such materials are generally overlooked. The IAQ Estimator software tool estimates indoor air pollutant concentrations at the design stage, based on emissions over time from large area building materials, furniture and office equipment. The estimator considers volatile organic compounds, formaldehyde and airborne particles from indoor materials and office equipment and the contribution of outdoor urban air pollutants affected by urban location and ventilation system filtration. The estimated pollutants are for a single, fully mixed and ventilated zone in an office building with acceptable levels derived from Australian and international health-based standards. The model acquires its dimensional data for the indoor spaces from a 3D CAD model via IFC files and the emission data from a building products/contents emissions database.